Well, would you look at the time. 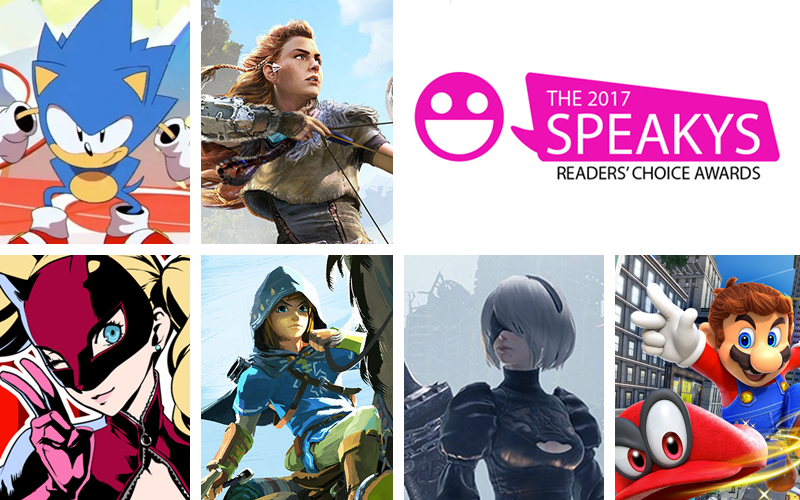 The Kotaku and TAY readers’ choice awards have returned! 2017 may have been a bit rough in many regards, but it was a phenomenal year for gaming as a whole. Which were your favorites? For those who don’t know, The Speakys are reader-run awards I organize every year to poll the general reader base of Kotaku and Talk Amongst Yourselves on their favorite titles of the past 365 days. This will be the seventh year The Speakys have been featured, and it’s always interesting to see which games come out on top. Last year we decided to streamline the whole voting process by just giving readers one long list of all the games from this past year. We’re going to keep that tradition going. To keep folks from having to decided between a handful of their favorite games I’ve given everyone the option of picking up to FIVE games. You can’t pick less than one (obviously) or more than five. Do I need to explain this further? That’s all there is to it! So vote away, and if you have any questions check the FAQ or let me know in the comments below. When will you post the winners for this year? Winners will be announced Saturday, Jan 6. I decided to take all ports and remasters of current games off the list. A good number of past games made their way onto new consoles this year, but since they were likely featured in a previous poll it just didn’t seem fair. Feel free to write them in if you really want to give them a vote. If we left one or two on the list that should have been scrapped, we apologize. You forgot to put my favorite game on the list. Why do you hate me? We didn’t mean to forget your favorite game. Our crew scoured the internet for the best games of the year, but we may have missed a few. Also, you can just write in any game. So quit whining and do that. Can I just write in a bunch of joke answers or games that didn’t come out in 2017? Aside from myself, this years list was curated by Zarnyx, AstronaughtE, and MegaChromatic.